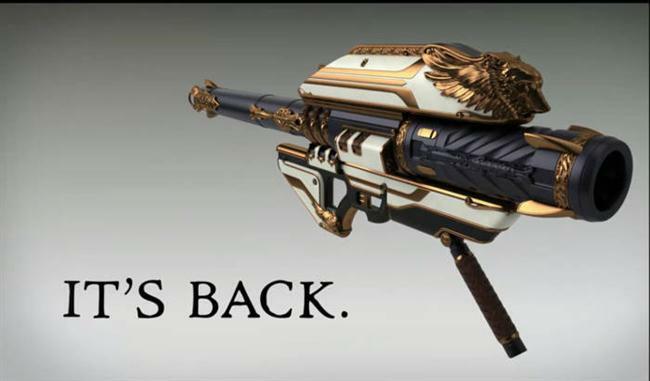 Another set of leaked images has confirmed that Gjallarhorn, or Ghorn as it's commonly referred to, is back again! 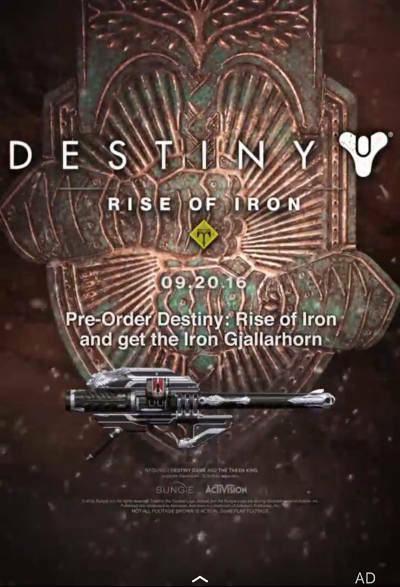 Renamed as Iron Gjallarhorn this new Exotic rocket launcher is rewarded following a Rise of Iron expansion quest. It's a beautiful addition to any guardians arsenal! We all remember the love for GHorn back in the early days of Destiny. It was simply the best Exotic weapon in the pack and greatly out-powered any other heavy weapon; reducing almost every boss to tears in seconds. Combined with a stockpile of heavy ammo synths, a guardian could safely smash through the Nightfall and Raid with the reassurance that GHorn would always be there to help out. Come Year 2, and Destiny said enough's enough and reduced GHorn to a replica of its old self and never gave the weapon an opportunity to push up to the new attack values that other exotics were granted. Some complained but many understood that GHorn was far too overpowered and the good days were gone. 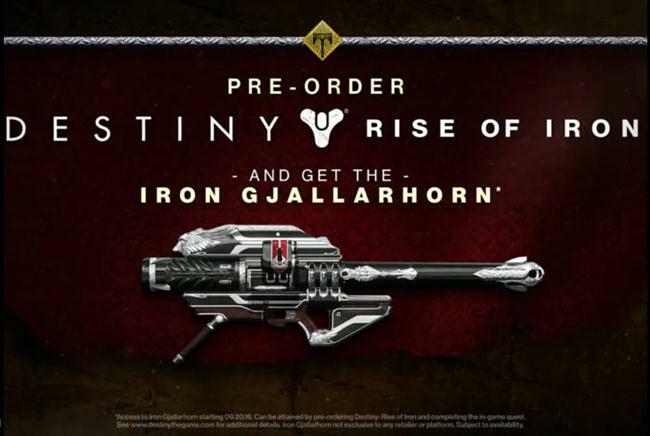 Now with the upcoming expansion for Rise of Iron, Bungie have once again reinvented the weapon as Iron Gjallarhorn - a Year 3 version of Ghorn. 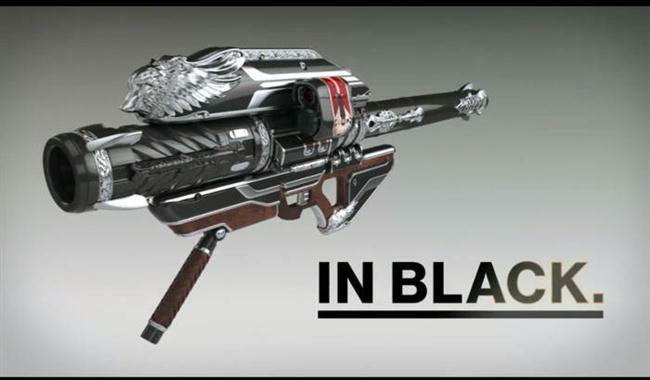 Rather appropriately, Bungie have used the term "It's back"...."in black" as the trade mark for the return of every fans favourite weapon. We don't know if this weapon will be as good as the original, it's doubtful that Bungie would make the same mistake, but we can be sure that it will still pack that familiar punch and should be part of every long term Destiny fans arsenal! How to get the Year 3 Gjallarhorn and Iron version? The new Year 3 Gjallarhorn is a reward from one of Rise of Iron's quests. Players will be pleased to know that the weapon is NOT a pre-order exclusive and the quest can be unlocked in other ways. However, the Iron plated version of the weapon is reserved for those who pre-order - it's just the skin that's different. Much like the Exotic sword from The Taken King and all of the original exotic quests from the base game, players have to complete a challenging set of tasks to earn the new weapon. The exotic quest can include a combination of things such as collecting rare materials, completing story missions and defeating a boss or two. As with all Exotic quest lines - things will NOT be easy! The images below appeared briefly in a snapchat trailer ad, but have been captured in all their glory. Take a look at the new design for the black version of Gjallarhorn and wet your appetite for everything to come in the Rise of Iron expansion. It's got a metallic but glossy, solid iron feel to it. Intricately decorated with emblems and carvings. It's beautiful!